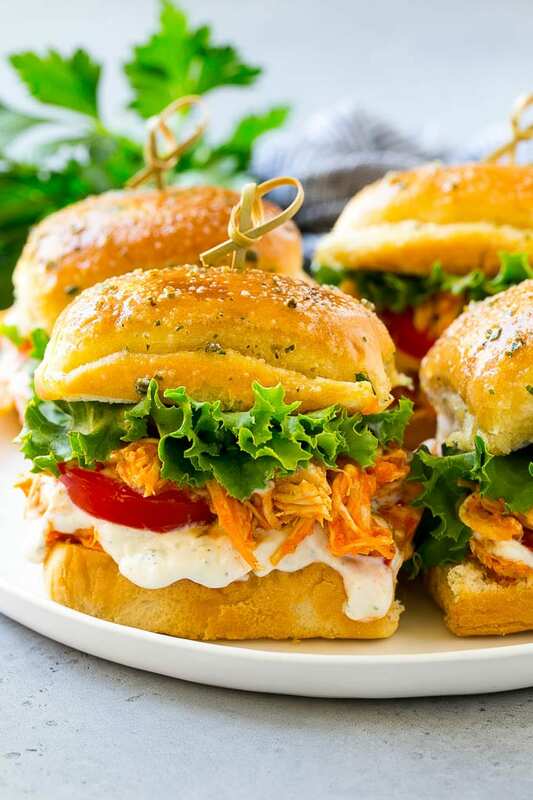 These buffalo chicken sliders are warm sandwiches filled with shredded buffalo chicken, ranch sauce, lettuce and tomato. The ultimate party snack! 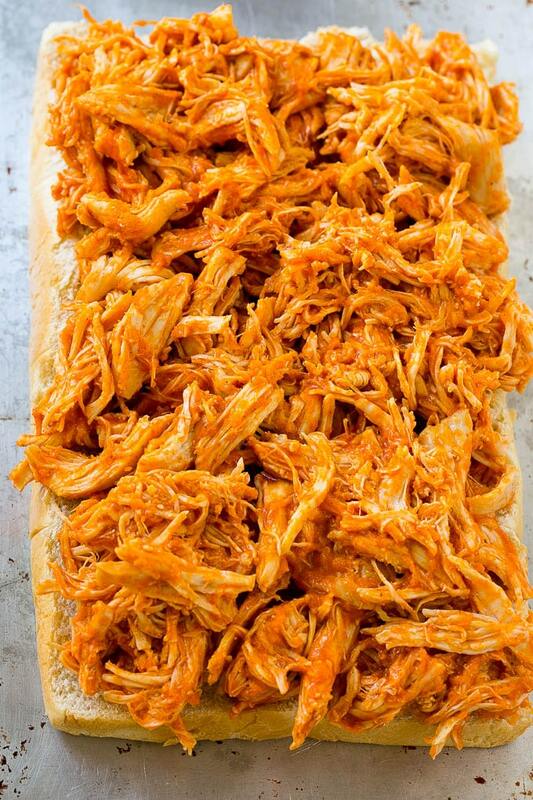 Buffalo chicken takes a new form in these hearty sandwiches. The buns are brushed with garlic butter and baked to golden brown perfection, and the lettuce, tomato and ranch provide the perfect cooling counterpart to the spicy chicken. I have fallen in love with slider sandwiches of all types and varieties. 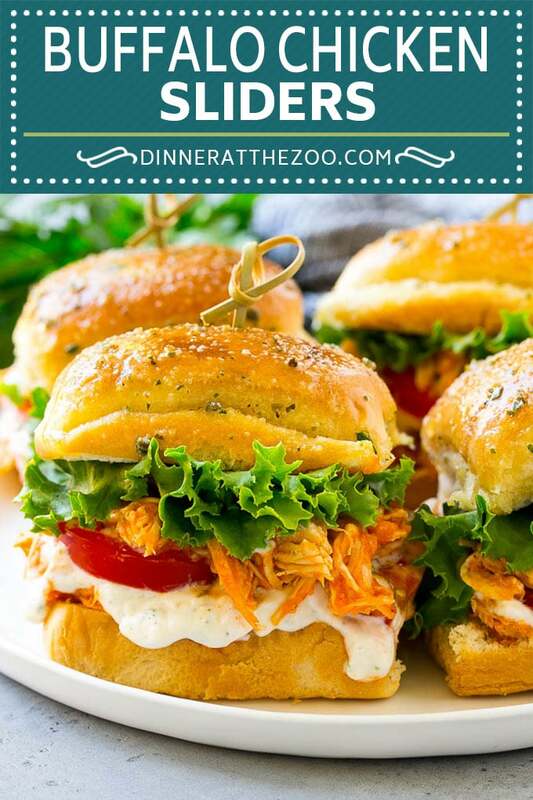 I like making my own versions and these buffalo chicken sliders definitely made it to the top of the list as a favorite. They’re packed with flavor and super easy to make. HOW DO YOU MAKE BUFFALO CHICKEN SLIDERS? 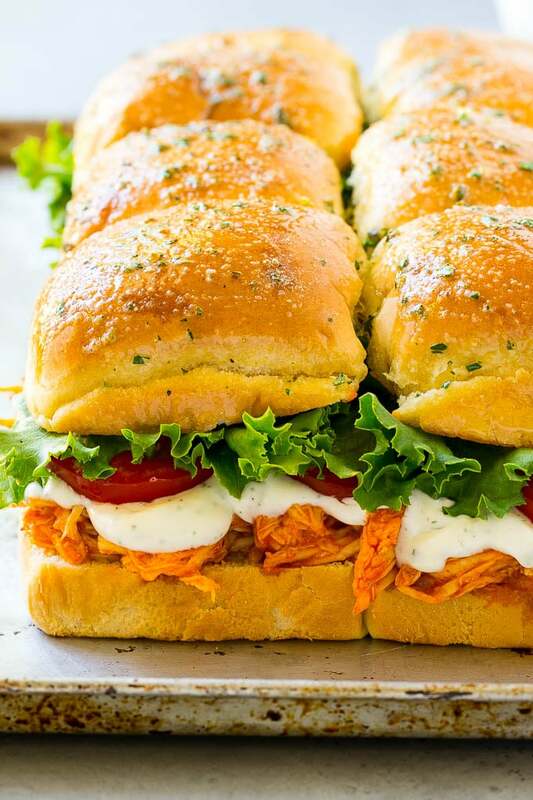 This buffalo chicken sandwich is stuffed with shredded buffalo chicken, ranch sauce, lettuce, and tomato. These sliders work great as a meal but truly are the best party snack. They’re just the right size and full of bold flavors. 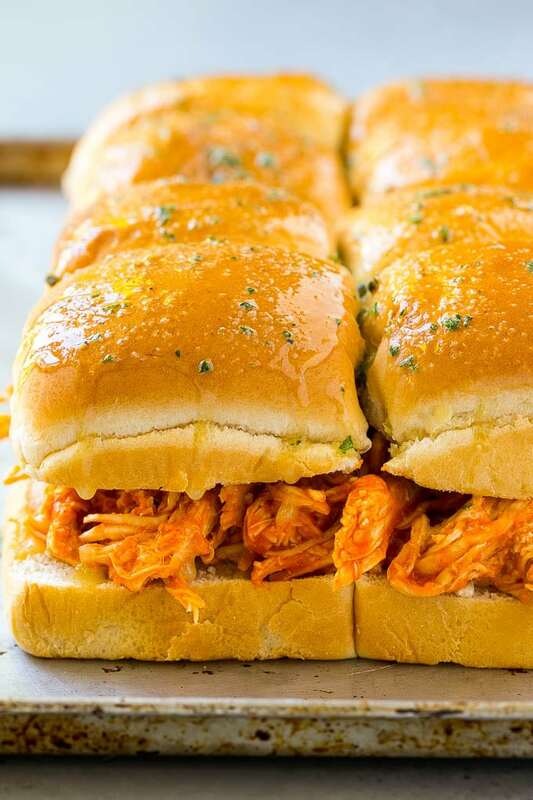 When making your buffalo chicken sliders, any shredded chicken, including roasted chicken, chicken cooked in the slow cooker, or store bought rotisserie chicken will work. Be sure to toast the bottom bun first so that the sandwiches don’t get soggy when you start layering. There’s nothing worse than a soggy sandwich. You can use store bought ranch or or make your own homemade ranch using this recipe HERE! 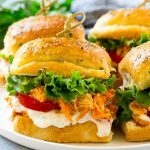 If you’re a blue cheese fan, a blue cheese dressing would also pair well with these buffalo chicken sliders. It is best if the sandwiches are served immediately. CAN SLIDERS BE MADE ON THE GRILL? I have never personally made sliders on the grill. However, it can definitely be done. You’ll want to wrap your sandwiches tightly in foil to make sure they hold together on the grill. A slider bun is smaller in size than, for example, a hamburger bun. They’re softer and flat on bottom which makes them the perfect bun for recipes like this one. Most bread companies refer to them as the slider bun so it’s usually not hard to spot which ones you need to purchase. They also often come in a single piece and you pull apart the individual rolls. There are so many different ways you can make sliders and most recipes are pretty easy. However, out of all the sliders I’ve had, these really hit the spot. They were a hit at our house and I have no doubt they will be at yours as well. Place the bottom half of the rolls on a sheet pan. Bake for 3-5 minutes or until lightly toasted. In a small bowl, whisk together the buffalo wing sauce, 4 tablespoons of butter and the honey. 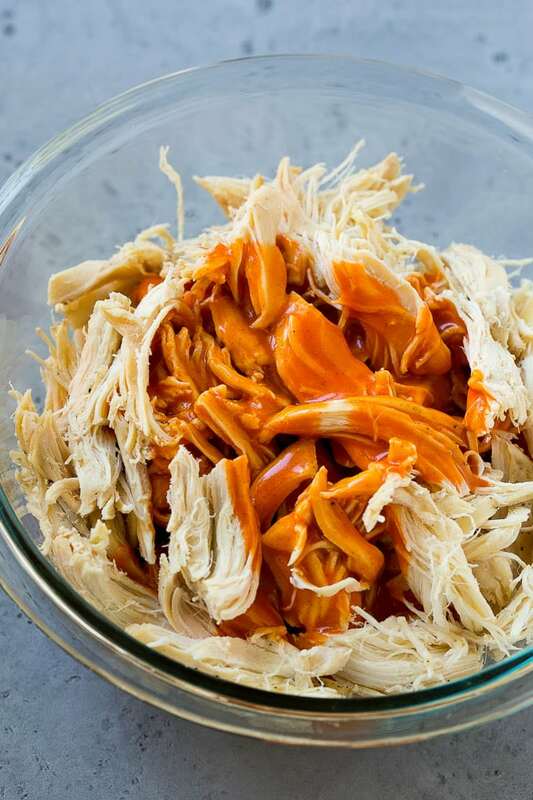 Pour the buffalo sauce mixture over the shredded chicken and toss to coat. Spread the chicken in an even layer over the bottom half of the buns. Place the top buns over the chicken mixture. In a small bowl, whisk together the remaining 3 tablespoons of butter, garlic powder and parsley. Brush the garlic butter over the tops of the rolls. Bake for 10-15 minutes or until rolls are browned. Remove the sliders from the oven. Cut the sliders into individual sandwiches. Remove the tops of the sliders. Layer the lettuce and tomato onto each sandwich, then drizzle with ranch. Place the buns back on top, then serve immediately. Wow were they delicious! I must admit I did forget the tomatoes! Total comfort food! Love that they’d make a great appetizer or a main dish. I know for sure thiesewould be a huge hit in my house! I gotta make these! Look so great! These need to happen! I love this idea! These look so delicious! Such a great appetizer recipe! These would be an instant hit in my house! Very pretty dish! This look amazing! I definitely want to try your recipe, and I’m sure it’s very tasty. THANK YOU! These look so tasty!! Love those buns too!